Today is overwhelmingly a marking day. I still haven’t quite finished. The last possible moment is tomorrow morning at 9am so I’m not going too badly (considering it’s not yet 6pm the day before, ahem). In between the marking – all done on the computer these days; my red pens sit idle – I’ve been having a couple of other adventures. The first was a call-out to have a look at some snakes. They were arranged on the grass verge just outside Vi’s house opposite Centennial Park. As I approached with Bertie, I could see a cluster of people gathered around what looked like a posse of live snakes in the grass. I wondered if Bertie would react to them, but he wasn’t so easily fooled. Instead, he gamboled over to meet the people (Hi! Hi! Hi! Anything to eat?). Leif, who made the snakes, finds smooth slim branches down by the river. They remind him of local snakes. So he takes them home, carving, painting and polishing until they look extremely realistic. 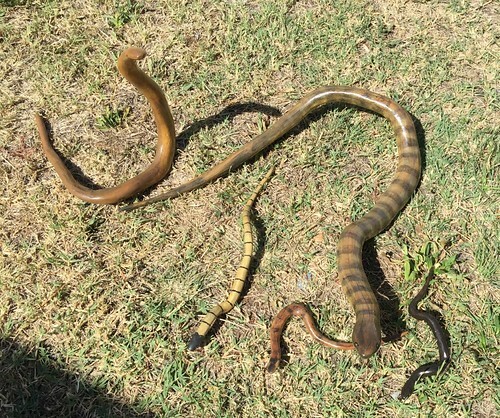 They’re all anatomically correct: tiger snakes, red-bellied blacks, eastern browns. I asked him if some of his snakes (he has over 50) could go on show at the 200 Plants and Animals exhibition that I’m helping to organise for BCCAN this year. He said yes, as long as we looked after them. Vi got to know Leif when he rebuilt the brick wall at the front of her house, which, very early on in the life of Bathurst, was an inn. While he was working on the wall, Leif collapsed. Vi called the ambulance. For a while Leif was completely down for the count. They did CPR on him, pressing down on his ribs. “I went to the other side,” said Leif, standing there with his snakes at his feet. I’m glad he came round, because his snakes will make an excellent contribution to the exhibition. Then more marking, interspersed with attempts to make decorative cupcake toppers out of fondant icing for my Afternoon Teal on Saturday. I can see why people do whole TAFE courses to get these skills. My teal “ribbons” look disgusting. They’re lumpy and very unribbon-like. 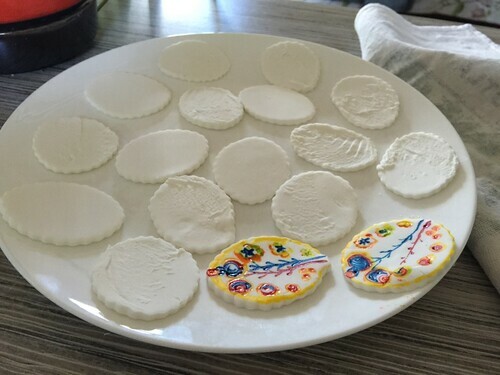 They look like a child’s efforts with Play Doh. I feel better about my fondant ovaries. I was able to use a cookie-cutter to get the basic oval shape; then it was just a matter of using food colouring marker pens (yes! there is such a thing!) to draw on the details. It’ll be interesting to see people actually eating them. This entry was posted in Bathurst, Bathurst Community Climate Action Network, Bertie, BRCA1, Craft and tagged 200 Plants and Animals, Afternoon Teal, anatomically correct cupcakes, community art, cupcakes, fondant icing, fondant ovaries, ovaries on February 19, 2015 by Tracy.